You know, living in New York you actually get to experience many Seinfeldian moments. The Soup Nazi’s store is shuttered and for sale, but it’s still there for the moment. Almost everyone I know, me including, got an unvitation (aka nonvite) to a wedding in India at least once. Loads of people are celebrating Festivus. And if you want, you can get to see Dominicans rolling cigars right before your own eyes. For 400 bucks you can hire them for your party (that comes out to 8 bucks per cigar which is not bad at all). Cigar rolling is a very intricate art and a very cool thing to watch. 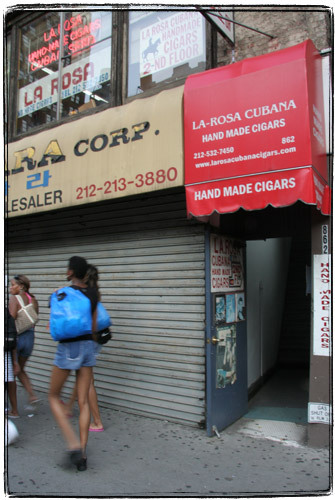 La Rosa Cubana cigar store/factory is located on 6th avenue between 30th and 31st. The guys there were kind enough to let me take a picture. Here is a cigar maker’s workstation, complete with inspiration. Unlike in that Seinfeld episode, these guys know how to roll cigars just right. Their King Churchill is very good.